Posted on February 18, 2010 by Notorious B.U.D. Gutierrez won't be able to hide out in the fog of Seattle much longer. Besides “free Krispy Kremes” and “Ken Griffey Junior”, no three words in the English language are more exciting to me than “pitchers and catchers”. When I hear that magical combination of words I know that Spring Training has arrived and another season of baseball is on the horizon. With each new year a fresh crop of stars emerge and make their mark on the game, elevating themselves from good players to great players. Just like Jessica Simpson on the last stages of her “In This Skin” tour, the following players are poised for a major breakout. 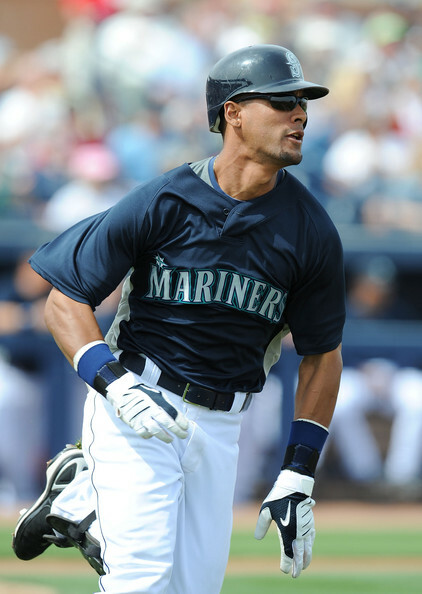 1) Franklin Gutierrez: In the eyes of most Mariners fans Gutierrez already had his breakout season—though no one outside of Seattle or the sabermetric community seemed to notice that in 2009. With a retooled roster that doesn’t include Carlos Silva (that’s one of my last shots at El Guapo, I promise) the M’s are a serious contender in the AL West and, if the team can stay in the playoff hunt late into the season, the best defensive centerfielder in baseball will finally receive the credit he deserves (or at least a Gold Glove). The affectionately named “Guti” made significant improvements at the plate last season, and if he continues to mature as a hitter, has the chance to become a legitimate 5-tool star. Don’t be surprised if Gutierrez goes for a line similar to .300-25 HR-90 RBI’s-20 SB’s in 2010…it is the Mariners year after all. 2) Madison Bumgarner: You can laugh at his last name all you want (and his first name while you’re at it), but it won’t change the fact that Madison Bumgarner is one of the top pitching prospects in all of baseball. In two ridiculous minor league seasons, Bumgarner has posted a combined 27-5 record with a 1.65 ERA, 0.97 WHIP and a nearly five-to-one strike-to-walk ratio. I don’t care if you’re playing in the Soda Pop Valley League…those numbers are hard to ignore. If Bumgarner can replicate his success in the minors for a Giants’ pitching staff that already includes Tim Lincecum and Matt Cain, San Francisco would become a very dangerous team in the wide open NL West. Will McCutchen become the best pirate since Captain Cook in 2010? 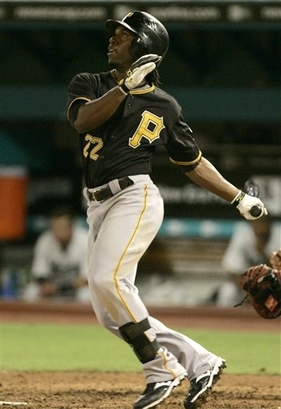 3) Andrew McCutchen: Hidden in the baseball wasteland that is Pittsburgh, McCutchen enjoyed a terrific rookie season, proving once and for all that the Pirates can occasionally do something right (although let’s be honest, A-Mac will be traded in two years). The former first-round draft pick finished fourth in the rookie of the year voting and put together a solid season at the plate (.286-12-54) and on the basepaths (22/27 in stolen bases). The young right-hander exhibited good patience at the dish and has the potential to become a 30-30 player for the next decade in Pittsburgh (or New York). It might seem like baby steps, but players like McCutchen are a step in the right direction for the Pirates…give ’em another 10 years and they’ll be right back in the thick of it (the middle of the NL Central that is). 4) Matt Weiters: Sure “Orange Jesus” didn’t quite save the Orioles as they walked through the Valley of the Shadow of Death (aka the AL East) last year, but that just means he’s in no danger of a sophomore slump in 2010. One of the most hyped prospects in recent memory, Weiters got off to a slow start in 2009 (.259 pre-All Star batting average) but finished the year with a flourish (.301) and he will be counted on to lead a group of young talented Baltimore hurlers that includes Chris Tillman, Brian Matusz and David Hernandez (each of whom could have made this list themselves). Weiters should be one of the top three catchers in the AL in 2010, and it won’t be long before he’s challenging Joe Mauer for batting titles and MVP’s. Bailey and the Reds are looking to make some noise in the NL Central this season. 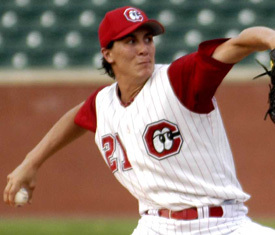 5) Homer Bailey: The number seven overall pick in the 2004 draft, Bailey has been anything but a homerun in his short major league career, though his finish to last season showed why the Reds thought so highly of him. The hard-throwing Bailey went 4-1 in September, with a 2.08 ERA and 42 strikeouts in 43 innings (numbers eerily similar to Zack Grienke’s last five starts of 2008–and we all know what he did the next year). Bailey will combine with Johnny Cueto, Edison Volquez and eventually Aroldis Chapman to form one of the best young rotations in baseball, and should turn quite a few heads in 2010. The Cincinnati Reds will be one of the biggest surprise teams in baseball next season due in no small part to the emergence of Bailey. Expect Homer to win 13-15 games with a sub-4.00 ERA and about 150 K’s.